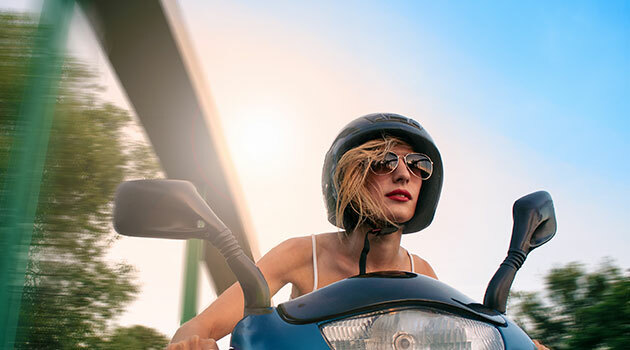 Motorcycles have always held a certain appeal for some, but in recent years, scooters, mopeds, and other types of motorbikes have gained popularity. As such, lawmakers have created regulations specifically related to these bikes, such as helmet laws. Helmet laws have been around since the 1960s and each state has adopted its own policies. Some states require every motorcyclist and scooter rider wear a helmet, while other states do not. At the same time, the type of required helmet varies by state, ranging from half, full-face and three-quarter shell helmets. States like California, the District of Columbia, Louisiana, Maryland, Michigan, and many others require that all riders must wear a helmet when they are on the road. Check your state’s driver handbook to see if your state falls under these laws. States, like Vermont, Colorado, New Hampshire, Illinois, and Iowa do not require moped and scooter riders to wear a motorcycle helmet. Some states, like New Jersey, require scooter riders to wear an approved reflective helmet, in addition to a face shield or goggles, unless the bike has a windshield. Some states also require that drivers wear a regulation helmet with the chin strap fastened. Some states, like Texas, require riders aged 15 to 17 to take a motorcycle safety course before they can apply for a motorcycle license. Other states, like Ohio, allow drivers to be as young as 14 years old to operate a moped. The age of scooter drivers also varies by state, so keep this in mind if you are purchasing a scooter for a younger adult or teen driver. Some states, like California, do not require the scooter driver to carry registration, liability insurance, or license plates. Check your state’s requirements to see what you need at all times when you’re riding on the road. The state of California also says that scooters can be operated on roadways with bike lanes, bike paths and trail, but not sidewalks. Check your state’s driver handbook to keep up to date with scooter laws.